Welcome to our Oceanside Location! Do you have a vision for your landscape and worry that it might be too expensive to obtain all the plants and trees you want to make it a reality? We have some good news for you at Evergreen Nursery! You’ll love that we offer wholesale pricing to the public! So go ahead and get those rose bushes, shade trees, succulents, fruit trees and much more! Be sure to talk to one of our knowledgeable nursery professionals. Here at Evergreen Nursery you'll also find a superb selection of landscape materials. Choose from gravel, decorative bark, sand, mulch, amended topsoil, brown shredded wood and much more. 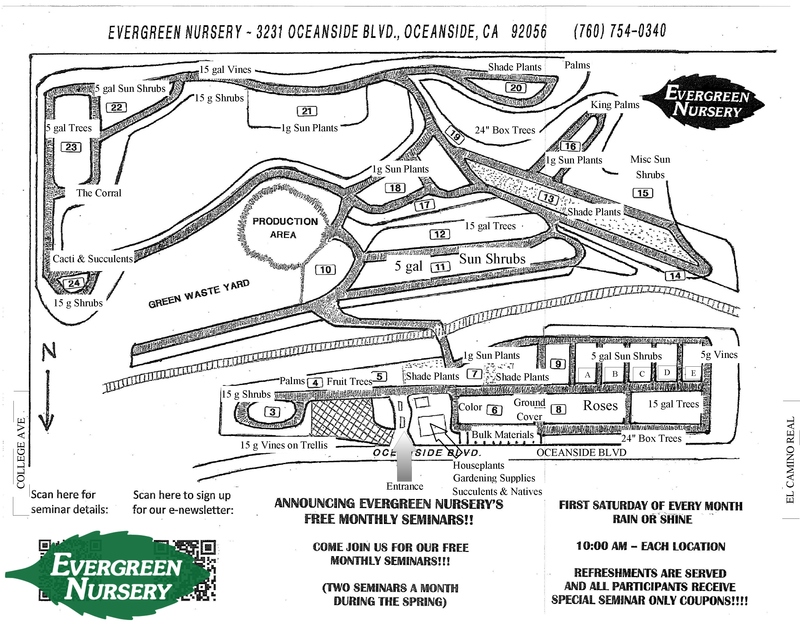 Many of your friends and neighbors have been shopping at Evergreen Nursery for years. We look forward to meeting you at our Oceanside location. Please view our video to see what our customers have to say and learn more about us.